Emergency Pest Control Like You've Never Heard It Before! Stories of Wildlife Removal That Will Have You in Stitches! 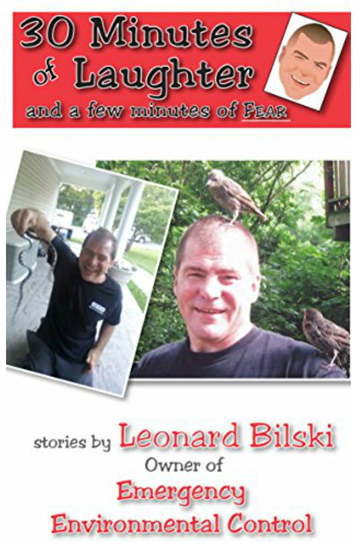 Lenny Bilski, owner of Emergency Environmental Control, shares stories of his adventures with the creatures, critters and creepy-crawlies that make most of us cringe in 30 Minutes of Laughter. The book is a compilation of some of his funniest, creepiest and even sentimental moments on the job over the years as he helped residents of Long Island, Queens, Bronx and Westchester with their emergency pest control problems. From bat removal to rat removal, you'll read stories you'll never forget! Click here to buy Kindle version at Amazon! Click here to download audio version from cdbaby! Click here to download audio version from iTunes! Click here to download audio version from Amazon!